My house does not always look the way it does on Instagram. GASP! lol I’m sure you’re not shocked. I have two small children, and when they get to playing…. it’s tornado time! 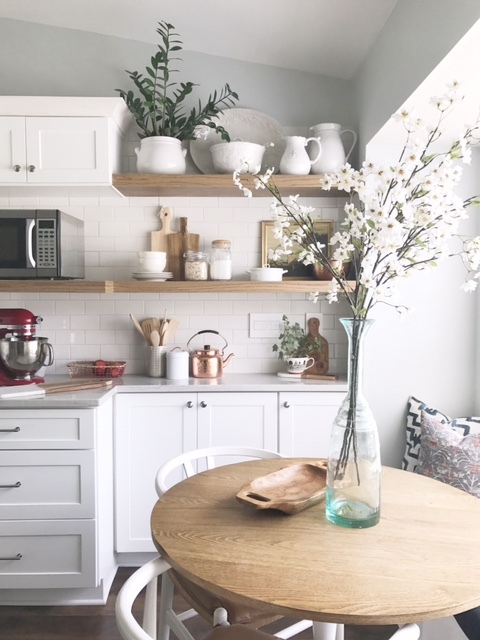 BUT- I will tell you that I have some tricks up my sleeve to hide all of the clutter and everyday ugly items and just get yourself a little more organized. This will come in handy when someone says “I’m stopping by in a few minutes” and you cheerfully say “OK!” and then rush around the house like a crazy person trying to pick it all up. I’m going to take you room by room and tell you my secrets to a “clean” and well styled home. Tip 2: Hide the ugly and/or gross. No one wants to see your toilet brush. I hide mine behind the toilet, kind of tucked into the corner. They also sell pretty toilet brush holders, but it’s still a toilet brush. Hide it. This goes for plungers too. We are lucky and have a garage, so we keep ours in a bucket out there. If you don’t have a garage, try to move it to a closet or laundry space where guests don’t have to see it. Plungers have been where no man wants to go. Keep them out of sight if possible. Tip 3: Buy some pretty bottles for your shampoo, conditioner and hand soap. We have a couple pretty bottles in our shower and then we do have our body wash sitting out. But, it looks a lot prettier to have less store packaging showing in the shower. For hand soap, I buy a pretty glass bottle and then keep refilling it with this one. Smells so yummy. Tip 4: Use baskets- use them to store your extra toilet paper, extra towels… whatever you can hide in a pretty basket or container- do it. Baskets rule when it comes to keeping the clutter out of eyesight. Tip 1: Baskets. (Yup, again) We use a large basket in our bedroom to hold some of my many throw pillows and any extra bags etc that may otherwise find a home on the floor. In a kid’s space, baskets are awesome for throwing loose toys inside when you need to clean up in a hurry. I try not to have the girls keep toys in their room (books and stuffed animals are ok but the rest has a home in the playroom) but their toys always find a way in there anyway. That’s where a big empty basket comes in handy. Scoop and dump. Done. Tip 3: Hooks on the wall. If you know you always have hats and bags that end up on the floor or dresser, hang a set of cute hooks on the wall to make it look like you meant to not walk the extra 10 feet to put them away in the closet. LOL But seriously, hooks give you a chance to make some “art” happen on your wall with cute bags, jackets, hats, etc. Next is the queen of clutter, the kitchen. Tip 1: Use trays. I love the look of a cute tray on the counter or island that holds salt and pepper shakers, olive oil, candles etc. It’s the same principal as in the bathroom- trays make clutter on the counter seem purposeful and cute. I currently use two. One by the stove and one on the island to hold all of my candles. Tip 2: Cute sponge container. I love to use a cute container, like a ceramic berry bowl, to hold sponges in. It takes them off of the counter and is a chance to display a cute ceramic. You can also buy pretty dish brushes with wooden handles vs the ultra bright ones. If there is a stylish option that’s a few more dollars- go for it. Those little details really do elevate your kitchen. Tip 3: Nice soap dispenser. I do the same thing out here as in the bathroom. I buy a pretty soap pump and then refill it with inexpensive soap. You can get a pretty color to match your decor or opt for clear or an amber bottle. Either way, it looks a lot cuter than a plastic bottle with a brand logo sitting out. Tip 4: Crocks, lidded jars, and containers. Buy pretty items to store your kitchen items when you can. I love a pretty crock for wooden spoons. My bread tin is one of my favorite kitchen decor items. I keep my tea bags in a cute tin, sugar in a lidded jar, etc. SO many items can all be kept in a pretty container vs sitting out on the counter or hidden away in a cabinet. Tip 5: Basket or bowl “catch-all” In every kitchen I style, I add an empty basket or bowl of some sort on the counter. Why? Because we ALL throw random stuff onto our countertops. This way, its all in one little area and it just makes it appear we have our act together when we clearly do not. Ha! Tip 1: You guessed it- baskets and containers. This time I’m talking small. You need a place to put your dryer lint, dryer sheets, and also another basket for loose items. And finally… The living room. Tip 1: Lidded box(es). I love using a lidded box to hide remotes and any other small items you might have laying around. It’s not like its a huge deal to see someone’s remote, but when all you see is a pretty, well styled coffee table… its niiiiice. Tip 2: Do I even need to say it? Baskets. LOL I use baskets in a living room or family room to hold blankets, toys, or just anything you need to get off the floor in a hurry. Basically, baskets are the stylish person’s way to throw all the junk into a pile until you actually have time to REALLY clean. So that’s it! Hopefully you took away at least one thing you hadn’t thought of to keep your home more organized and styled on a daily basis. So… who’s ready for a pop in? !